I’m a sentimental person by nature. I am a part of the generation that logs onto websites like BuzzFeed daily to look at listicles detailing all the parts of my life that are no longer here. For all the Wonder Balls and Butterfingers BBs that I can’t get back I still hold special places in my heart and my life for shows that I grew up with. I had an interesting and, without a doubt, interesting childhood growing up with Osteogenesis Imperfecta. I developed relationships with television shows on deep, personal levels. This is why I wrote one of my favorite articles on Unbreakable, Trains, about Thomas the Tank Engine last year. I talked about this sensation with wanting to grow wheels and journey around the Island of Sodor. But that wasn’t my only love when I was a kid. Much like every other person I know I grew up with a cuddly, innocent bear who was always in a search to get hunny to satisfy the rumbly in his tumbly. He’s also laugh out loud funny when he wants to be. Even sitting and watching clips today online of Pooh’s antics had me giggling in my room despite the fact that I’m at least double what the target audience age is. This doesn’t trouble me, because I am a believer that funny is funny regardless. The number of times I have quoted the opening scene of this clip package, the one in which Pooh is gravely concerned about Owl’s sneezing, is close to infinite. I saw Winnie the Pooh, the theatrical movie that came out when I was a junior in high school, the week it opened. I am not ashamed to admit that in the theater I was laughing to the point that I needed to physically catch my breath. It’s just brilliant. It could be because I’m too old to appreciate it now, but looking back upon the children’s shows of my generation, the mid to late 1990’s, the writing was as strong as anything you could find. Winnie the Pooh wasn’t new to my generation, however. He had been around for at least thirty years by the time he made his way out of the Hundred Acre Woods and into my living room. The above clip is from the first Winnie the Pooh movie in 1966. Even then he was the cutest thing in the world. Watching those opening credits takes the mind, or at least mine, back to an era where responsibilities began and ended with not spilling milk or hitting my younger brothers. What makes Pooh lovable to me even now is that after exercising for no more than half a minute then he is convinced it is time for “something sweet.” He goes on to declare that he is “short, fat, [and] proud of that.” Pooh may very well be my soul mate. But what sticks with me, again, is the writing of the stories that inspired the shows I would watch as a kid. Pooh and Christopher Robin have quite possibly the greatest friendship in the history of fiction, with Piglett and Pooh finishing in a close second. To watch Christopher Robin approach the topic that he’d never want to face – being without Pooh – is more heartbreaking than any other moment in cinema. It also inspires Christopher to tell Pooh the most heartwarming thing possible. For no reason today I found that clip online, watched it, and promptly started bawling my eyes out on my bed. This is no exaggeration, I started sobbing at how sweet this was during the middle of the afternoon. How could you not? 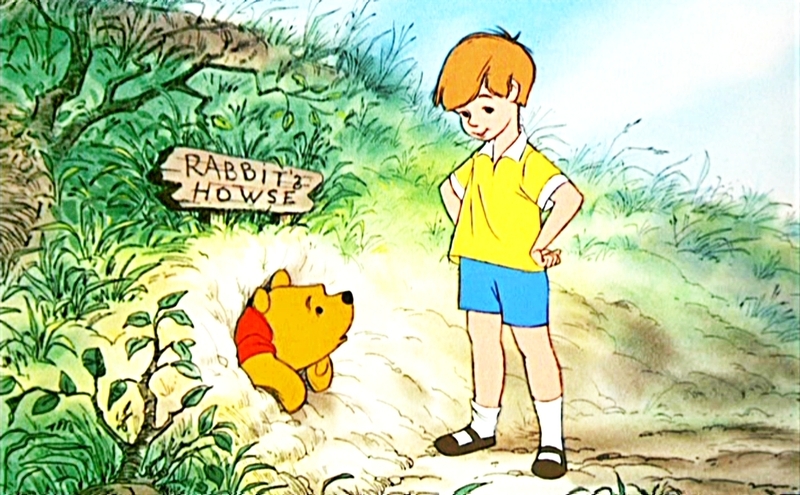 Christopher Robin has never and likely will never love anything as much as he loves Pooh, and vice versa. The thought that one day they will be apart is something no one ever wants to imagine. But given that one day it will be true, the promise that they will always be together is as sweet a sentiment as any. That is why I started crying a river on my bed in the middle of a Tuesday. If you weren’t choking up, even a little, while watching that then you are either lying or possibly made of stone. I’m closer to being 21 than 20 now. It’s been over a decade since I have even regularly watched or had Winnie the Pooh in my life. We have been apart from each other for quite some time. But just like Christopher Robin before me, I knew that no matter where I went I would always have this bear with me. One day I will invariably pass down Winnie the Pooh to my kids, or my brother’s kids. I will share it with them because I would love if something that gave me so much happiness as a kid did the same for them. I’m a sentimental and nostalgic person. Everyone I know is. But sometimes it’s nice to know that something you loved once upon a time you can still love now. It’s even better when you can know that any time you return to it in the future you will still love it. Few things are eternal in this world, but the magic and joy of the Hundred Acre Wood, and the bear searching high and low for his sweet, sweet hunny within, will always be there.